Members of group: Grenville, Joyce, Gladys, Eileen, Pat, Phillip, Jeffrey (‘Jethro’), Meg. Also present were Steve (community worker) and an unnamed woman out of shot. 00.04 – Jethro: I’ll tell you something. My dad was good with wood. He used to make us all like toys, forts and a circus and other things that I when was a kid. One night he came home, said I’ve got the wood like that and he made a big fort like that, and it looked like a good fort. Looked like it had just been built up on a hill or something [laughs]. Andrea: So he made them all himself? Jethro: Yes. With wood. He was in the navy and he done a bit of carpentry. He was handy with wood. Made farms, everything. Andrea: Did you ever help him? Or were you not allowed to? Jethro: He let me help him, but sometimes I was helping my mum more than my dad, doing all the washing up. Yes, mm. Eileen: I was given a beautiful dolls house at one time. Eileen: Quite lovely thing. Very fortunate there. Andrea: So did someone make the doll’s house? Eileen: No, I don’t think so, it was a bought one. It was a lovely thing. Andrea: It was a bought one, but your dad put things in it. Eileen: Yes, yes made all sorts of little bits to go in it. Quite nice. The best thing I ever had, apart from a bike later. Andrea:. And because he’s such an old bear, inside his head, he’s all stuffed with woodshavings. You know a lot of the bears from that time were quite hard, they weren’t very cuddly at all, no, not like the sort of like soft cuddly bears you might buy little children these days. Andrea: They are nice aren’t they? Jethro: You need to bring more of them [laughing]. Andrea: He’s great, Archie, I love Archie. Pat: Whereabouts do you come from, these toys? Andrea: The Toy Museum, the one under Brighton station. Have you ever been there? Pat: Yes. I’ve been there, but not very near here. Pat: Oh look, she’s got three now. Andrea: You’ve got all of them now, do you want to actually pass some that way? Andrea: What’s that made out of is, I think it’s this one, that if you, you can see, It’s a bit like papier mache. Joyce: Got drawers on. At least you’ve got drawers on. Audio only (no video) until 09.25. Then audio only between 10.55 & 11.42. There are a couple of sections where there are overlapping voices chatting. 00.05 – Andrea: So if we start over here, what’s your name? Andrea: And when were you born Joyce? Gladys: I’m Gladys. I was born in Brighton in January 1920. Andrea: Okay. Where were you born? Andrea: 1958. Thank you. And what’s your name again? Jethro: My name’s Jeffrey, and I was born 1951 at Brighton Hospital. [another voice ‘youngster’] Up Elm Grove hospital. Andrea: Okay, I know it. Andrea: Okay, let me finish the sentence, if you’re happy with this idea, this is what we’ll do, we’ll get Holly to go round all of you and ask each of you in turn what you remember about your teddy bears. It might be you don’t remember anything. And if you don’t remember anything that’s fine, and then we’re going to ask you the same sorts of questions about dolls, and the same sorts of questions about construction toys, and then we’ll have a look at what we’ve got on the table as well. Does that sound okay? Gladys: I’ve got no memory at all [laughs]. Andrea: Then that’s, nor have I, people ask me, I go I can’t remember. Go on then. 02.16 – Holly: So who remembers their teddy bear? Who wants to go first? Eileen: Never had one. No. Andrea: You didn’t have a teddy bear? Gladys: No. I don’t think I had one, no. I can’t remember one. Holly: That’s really interesting, because most of the people we’ve spoken too so far, a teddy bear is their staple toy. Andrea: I was talking to a lady the other day who was born in 1918, and she had a teddy bear, but her teddy bear had no legs. And I asked her why not, and she said it never had any legs. It was second hand when she was given it, and when she got it it had no legs. Pat: Blimey. Perhaps it was born like it? Andrea: Well, I imagine that the child who had it before her, maybe it lost its legs then. Pat: Oh, yes, could have been. Andrea: Did any of you have teddy bears that you remember? Jethro: Well all of them then were having a quad bike. Jethro: I was saying to the man, I had a toy like that and Dinky toys and all that and little cars, used to play out, alleys all them sort of games, Dinky’s had no doubles or no. Andrea: So did you have a teddy bear? Andrea: You didn’t. Did you? Pat: No, I had dollies. 04.06 – Andrea: Okay. So maybe we’ll think about dolls then, if no one can remember teddy bears. What about dolls? Can anyone remember having dolls? Gladys: Yes. I had a doll. Andrea: Holly the floor is yours. Holly: So do you want to tell us about your doll then? Holly: Okay, so what were your dolls’ names? Gladys: and I had a little pram to push it around. Holly: Do you remember what her name was? Do you remember the doll’s name? Gladys: No I can’t remember what I called her. Holly: Do you remember how you used to play with them? Gladys: Oh yes. We’d have little tea parties. Holly: Sounds very nice. Do you remember what happened to it? Holly: No. Okay, no worries. Who else remembered having a doll? Joyce: About that size, bit bigger than that actually, Peggy. It was a gift from an Aunt, the only one I ever had. Holly: Ah. What was, how did you play with Peggy? Joyce: Oh, just sit and cuddled her. Not games at all, no. Holly: Did you say you remembered a doll? Pat: Long time ago I did, yeah, and I had dolls’ house as well. Holly: Yes? What were your dolls called? Pat: I don’t know [laughs] I can’t remember. Holly: Does anyone else remember having a doll? Eileen: Yes, I did have a doll. I can remember how I gave it away. Holly: Did you? Who did you give it away to? Holly: How old were you? Holly: Oh okay, so you felt you’d grown out of your dolls, and the hat was more, I can see the logic there. Eileen: And that child was more than grateful because toys were so scarce, they really were. Pat: Some people didn’t have toys did they? 07.09 – Holly: So how about construction toys. Does anyone remember having or playing with construction toys? Holly: Yes? What did you make out of your Meccano? Grenville: Oh cranes and things. Andrea: And this would have been the old metal Meccano wouldn’t it? Andrea: Yes. Can you remember what colour it was? Gladys: Green and red wasn’t it? Andrea: I was going to say, we’ve got a bit. My only bit of Meccano that I’m carrying is some old green Meccano. ‘Cos it changed colour in later times. Didn’t it? Pat: Yes. Got green there. Andrea: Yes, this is a green bit. Pat: Where’s the red one then? Andrea: The red bits are still at the museum. I’ve got lots of red bits, lots of green bits, lots of wheels, but I’ve only brought a little bit up today, thought otherwise we’d end up playing with all the Meccano. So you built cranes? Grenville: Well I had a model railway set. A fort with soldiers in, and things like that. Andrea: Mm. What about, who else had Meccano? Jethro: I’ll tell you something. My dad was good with wood. He used to make us all like toys, forts and a circus and other things that I when was a kid. One night he came home, said I’ve got the wood like that and he made a big fort like that, and it looked like a good fort. Looked like it had just been built up on a hill or something [laughs]. Andrea: So can you remember where he made these things? Did you see him making them? Jethro: No, he did it in his shed. Jethro: And my ma said don’t go in the shed for nothing, I think dad’s making something. That’s all she said. Andrea: So the shed was in the garden? Jethro: He locked the shed up with him in there. You know it wasn’t locked. Me as being a kid you know, being a bit curious I was listening by the window there, and see what he was doing [laughs]. 10.28 – Andrea: Did any of the rest of you have toys that were handmade by grown ups? Pat: Well, I used to make toys out of what he said, wood. At school. Andrea: What did you make? Pat: A little doll. I can’t remember what it’s called though. Andrea: Can you remember what it was made out of the doll that you made? Pat: Little things I made. Andrea: Like that? Can you remember how you made it? Pat: Not very good. I think I joined up. I’m not quite sure. Holly: So does anyone else remember homemade toys or making toys? Steve: I don’t remember homemade toys, but if I dare to interject, I’ll never forget Jeffrey’s reminiscence prompted one of mine. I came down one Saturday morning when I was a nipper and my Dinky toys were well bashed about because I used to race them around [cheering], and my dad had suddenly decided that the battered ones had lost so much paint he was going to paint them all red, identical, and he thought he was being really helpful. I was about I don’t know, seven or something, and I remember thinking oh no, but I didn’t have the heart to tell him, dad, please don’t, just stop now. He said there you are son, they look so much better [laughter]. The bus was bright red, the tram was bright red, the army chieftain tank was bright red, and I just sat there thinking oh dear, and I didn’t have the heart. I was so disappointed and he said there you go son, they’ll be good now for another year or so. Steve: Before I chipped off the paint again? Holly: Chipped off all the paint again, yes. Steve: I think I grew out of them within the next six months. Andrea: So you didn’t repaint them then? Steve: No. that was enough of repainting to last me a lifetime. Andrea: So did someone make the dolls house? Andrea: And you said you had a dolls house too? 13.22 – Gladys: I do remember having a dolls house, but the thing that I have had, nothing to do with toys really, a pencil and paper. And I’d draw for ever, draw all sorts of things. And that lasted me right through my life up ‘til recently, can’t do it now. Andrea: I think that’s what’s interesting actually, is when you think about what you used to do as children, and what you used to play with. A lot of what people played with wasn’t toys, [No] it was as you say pens, bits of paper, playing outside. Gladys: I used to save all the wrapping paper and every bit of paper I could collect, scribble on it. Jethro: I used to do that at school, make paper chains and all that for Christmas. Pat: Decorations yeah. We had paper decorations. Jethro: Me and Pat used to go to the same school together. Andrea: Okay. Where did you go? Pat: I went to Carden first because I liked Carden best. Holly: That’s interesting. Because in one of our practice interviews I spoke to a guy who he used to play with Lego, but now he does stop animation. So like you his play influenced his career. Gladys: Oh definitely. I’ve drawn and painted all my life until just recently. I can’t any more, my hands won’t do it. Eileen: Can you imagine a pair of skates? Eileen: and that caused no end of arguments. Eileen: Worst thing that could ever have been done. Andrea: Really. So you were meant to share them as in you played with them sometimes and it wasn’t one each? Eileen: It was actually one each. Andrea: What sort of skates were they? Eileen: Oh just ordinary steel, nothing right brilliant. Andrea: The sort of steel ones with the straps? Eileen: Yes. They must have been crazy to have given it to us. Jethro: Yes. It was funny one day, this kid who was the same age as me. I said have a go on my bike, and he didn’t come back on it, he was riding all round Bevendean on it. I chased him all round Bevendean, right down to the Avenue where I lived. And don’t go to violence, don’t listen to violence. And it took about ten kids to hold me back, to hold me back for that kid because I was going to hit him, and said what you’re doing with my bike, know what I mean. Andrea: Did you get it back? Jethro: Yes well I did, but I’ve got ten kids stopped me you know like, pulling me back and all. It was this certain one boy at the time you know took me round the house, cooled me down it’s a nice boy and I still know him now, you know. 17.18 – Andrea: Thinking about toys. Shall we have a look at what we’ve got here Holly? Gladys: I think a lot of children didn’t have many toys. They used to play in the street, street games. Every child would be playing out in the street, be indoors very long, well mostly. Eileen: Make a swing of the lamppost. I did. Jethro: Chalking on the pavement [laughs]. Andrea: Getting stuck up trees. Andrea: Or the thing you do where you make the rope swing that goes over a stream, and then you see if you can get over the stream without falling in. 18.46 – Meg: My mother was an orphan, and she didn’t have anything in the orphanage, and I don’t think she knew much about toys and things, and she got a job when she left, and she was supposed to look after a baby, push the pram and take it for walks in the pram and she couldn’t push it straight because she’d never had a dolls pram herself, she didn’t know how to treat her own babies because she’d never had anything herself. A rather strange situation. Andrea: That’s interesting isn’t it, because I think there is something about the things you learn to do as a child, that then help you know how to do things when you’re grown up. Meg: She didn’t have a dolls’ pram you see, nothing when she was a child. She didn’t have anything to play with, so she didn’t know what to do with a real pram, when she was looking after a baby she didn’t know how to look after it. Holly: Anyone else got any memories of toys they’d like to share, or we can start with passing round the toys we brought with us. So we’ve got some dolls. Andrea: Start with the dolls. Oh no, what shall we start with? Let’s ask everyone here. Dolls or bears? Which do you like to have a look at first? 20.31 – Holly: We could send round a few of each. Holly: Sorry we’ve only got about four. Andrea: Bears are good for dancing. Gladys: I wonder who knitted that? Andrea: The one with the blue jumper was handmade, it comes from the nineteen fifties, and it was handmade by someone’s mother that one. And I really like him because his eyes are crooked. He’s not very well made, but he looks like he was loved a lot. Andrea: He’s lovely isn’t he? We’ve called him Bernard. Don’t know what his name was when the child who first had him owned him, but he’s called Bernard now, that’s what we’ve called him. Gladys: That’s just brought to my mind I did have a teddy bear but it was big. It would sit in a chair, quite a big one. I’ve just thought about that. I didn’t play with it much. Holly: So do you remember anything about him? About what colour he was or what his name was? Gladys: No, I don’t remember his name but it was very pale brown. Very pale. Holly: Do you remember why you didn’t play with him? Was he a very special bear? Gladys: I don’t know, I’ve just suddenly remembered it, you know. Its come to my mind, sitting in a chair, big as a young child it was really. Andrea: Or they were a company thing, they were a comfort thing, they were there to be cuddled if you were in bed, and feeling a bit sad, but a lot of people didn’t play with them or get them to have tea parties. Gladys: Sat in a chair, but if I had a little tea party then the bear would have a cup of tea. Holly: At least he got invited to the tea party then, it wasn’t left all the time. [Laughter]. 24.33 – Andrea: That one you’ve got there, that’s Archie. Andrea: He’s called Archie, he lives at the museum, well they all live at the museum. He’s missing an eye, he’s called Archie, it’s a bit of a bad joke, he’s missing most of his fur so it’s short for Archibald [laughter] I didn’t name him. But he is about, he’s getting on for a hundred years old that bear. Andrea: Yeah, he’s the oldest one we’ve brought with us. And because he’s such an old bear, inside his head, he’s all stuffed with woodshavings. You know a lot of the bears from that time were quite hard, they weren’t very cuddly at all, no, not like the sort of like soft cuddly bears you might buy little children these days. Jethro: [Laughter] Give them to me. Pass it on. He’s alright. Pat: Oh, I’ll hug you, you’re nice. Eileen: This is a quite clever one this one. Andrea: That one’s Sooty, the one with the black ears. Eileen: How old is that one? How old? Andrea: That one, he’s about, probably about sixty, sixty years old that one. Pat: He’s lost an eye. Andrea: He has lost an eye. Pat: He should have eye patches. Andrea: Should I get him a patch? Gladys: And a parrot on his arm. And a wooden leg. Andrea: A parrot. I like that idea. Eileen: Who’s going to take them? Andrea: Would you like me to take them back again? Andrea: What’s interesting about Archie as well is because he’s so old, his eyes are actually just on bits of metal, sort of like on metal spikes that go into his head, so when this eye fell out, it’s just an eye on a really sharp bit of metal. Pat: You should have put it back in. Andrea: Well I would have put it back in, but we get a lot of children coming to the museum who have a look at him, and we didn’t want it to fall out again, and a child get hurt, and then we get moaned at because a child scratched themselves on a bit of metal. Andrea: Exactly. I wouldn’t mind. But he’s also got, you can sort of feel, he used to have a squeaker, and I don’t know if anyone remembers, some of those old bears they used to squeak. Andrea: Or you used to turn them upside down, and when you turned them upside down they used to growl. I’ll stop talking. 28.36 – Holly: You can carry on talking if you like. So we’ve got a few of the dolls as well. Do you want to pick one? Do you want to pick one? No? Jethro: Not that one. Gawd. Haven’t you go a better one than that? Holly: Which one would you like? Holly: That one? Tiny Tears? Holly: That one’s a story doll, so it’s Little Red Riding Hood. I am aware I’m in camera shot. It becomes the Grandmother and the wolf in the back. That’s called, is it called a story doll? Andrea: Yes, so you can tell the whole story. Andrea: It’s always important to check. No name given: I think that’s something as girls we all did didn’t we? The minute you get one, you lift up the skirt to see what it’s got on. Andrea: Yes that doll there in the yellow dress that’s going round, she must be about eighty years old. Yes she’s nineteen thirties. Holly: Andrea, we’ve got a view of the doll over here. Do you want to say? 31.10 – Meg (re Tiny Tears): She doesn’t look like a doll at all. Meg: Well, she’s, Look at her eyes, she’s all made up, you know, and I wouldn’t like her one bit, because she’s sort of sophisticated, about twenty years before she should be. Jethro: No, ahh [Pat: Ahh], leave it to me, I’ll take her and I’ll care for her, put her to bed. Gladys: How old is this one? Andrea: That one‘s relatively new. I think she’s probably only about ten years old, but the whole idea I think has been around for sixty seventy years. [yes] I was talking to someone the other day who had a similar one but a Goldilocks one, so it was sort of like Goldilocks and then it was a bear and [clever, yes]. They’re really clever. Pat: It’s a good idea to turn it upside down. Andrea: They’re very cold, they are cold these dolls. Holly: I was surprised at how cold this one felt earlier. And it’s quite heavy as well, I thought for a child’s doll, it’s very heavy. Pat: What’s in that box there? Jethro: Cold. Come on I’ll come and warm her up a bit. Joyce: Have you seen this one Gladys? Eileen: Ooh that’s real heavy isn’t it? Andrea: Yes, she’s made out of sort of papier mache stuff that one, that hard one. She’s made out of something that’s called composition, which is sort of like paper and glue crushed up and set. Out of shot ? : If you dropped that one though, basically it would break. 34.44 – Andrea: It would. Yes. The lady who gave us that for the museum, told us that when she first got it, she did drop it, and her father had to fix her arm with, I think she said Elastoplast. So one of her arms is at a slightly different angle to the others. Because it’s actually all taped together at the top. But apparently I think she said she dropped it. I can’t remember if it was the day she got it or just afterwards, but yes, if you look carefully at her you can see where her paint’s chipped off, she’s all sort of grey underneath. They were really delicate a lot of those old dolls, so you know they were made out of that or they were made out of china, so I think if you had those sort of dolls you had to be really careful how you played with them, or as you say they’d just break wouldn’t they? Joyce: I only seem to remember the china ones mainly. Andrea: Do you remember them being played with, the china ones or were they for looking at? Pat: I had a china doll, long time ago, yes. Eileen: You can’t play with them. Hold them. Pat: I used to play with my friends. 36.12 – Jethro: I’ve got a little doll I put on the Christmas tree at Christmas. Little fairy doll on the top. Andrea: That’s what we need to put in one of these boxes, is a Christmas tree doll, we haven’t thought of that idea. Holly: No we haven’t. We’ve had hours and hours of meetings discussing these dolls as well. Pat: We’ve got wisdom haven’t we? Andrea: I knew that coming here would make us think of other dolls as well. Out of shot? : Not a wasted journey. Jethro: I know but it’s not my cup of tea really, but my mum, my dad used to get one for my mum and she always put it on top of the Christmas tree, you know and that’s how it’s there – and I’ve still got it now. Jethro: I don’t live with my mum, dad died and I’ve brought it up here so when it’s Christmas I put it on the, remember them, put it on the Christmas tree. On the top. Andrea: How big is it? Jethro: Yes, big like that. It’s got a thing holding like something. I don’t know what it is, like candles, summthing holding. Andrea: Some sort of a hook. Jethro: Yes. Umbrella or something. No, hang on I think it’s coming back to me. Think it’s like a magic wand thing she’s holding. Holly: Because she’s a fairy. Jethro: I think they just called me a fairy [laughs]. Called me a fairy [laughing]. And don’t believe it, they’ll put that in the book, fairy. Andrea: So the other thing we’ve got which is over here, is of course a rag doll. Has everyone seen the rag doll? Pat: Yes, long time ago, yeah. Andrea: Yes and I think a lot of people may have had rag dolls or had to make them, if anyone had to do sewing at school, sometimes people had to make rag dolls. Jethro: Ooh wouldn’t want to have that one in the house, in my bedroom, every day I’d would look and ooh, what’s that? Holly: Yes, I think she’s a bit scary.Andrea: Quite frightening? Andrea: Quite frightening. Who else thinks dolls are frightening? Jethro: Well some dolls are frightening, and some are not. Jethro: Like teddy bears or chalk dogs, like a model of a dog and that you look at it say ooh it’s a bit thing to me you know. Meg: This one’s’ nice because you can hold it very close to you with no resistance. Holly: Yes. She’s soft isn’t she? You can cuddle her without getting a bruise. Andrea: Or worrying about breaking her. Holly: Or worrying about breaking her. Andrea: That’s the thing with the hard ones isn’t it? It’s the way you play with them is different because you worry about them breaking. Andrea: Swung round and round your head by her hair. Meg: You could go to sleep with this in your arm. Holly: Yes she’s definitely a bedtime doll isn’t she? Steve: Do we want to have an actual break for tea? Or just tea as we go along? I’m aware that one of you’s got to go. Andrea: It’s up to you. I was going to say what we can do is we can sort of like look at the construction toys and then have tea and chat and carry on or break for tea now. Up to everyone else. 40.44 – Andrea – So we’ve talked a bit about dolls and you’ve had a look at some of the dolls. Holly: We’ve talked about bears. Andrea: Yes, we talked about the bears. So the other one I’d just like us to sort of like have a think about is these construction toys. [‘eh?’ ‘construction’] construction toys. I’m not going to pass them round right now because you’re still all juggling tea. Pat: I’ve finished my coffee. Andrea: Well not everyone. But I’ll show them, some of them and then we’ll pass them round in a minute. One of the ones I’ve brought along is these [clacking noise]. These are, are they Anchor bricks or Lott’s bricks, I’ve forgotten which they are. They’re Lott’s bricks. Because what these are is they’re actually made out of real brick. They’re stone. Holly: They’re quite cold like stones aren’t they? Andrea: Yes. They’re really, they’re quite lovely and they won’t really right now because I’ve been holding them for a while which of course warms them up, but they’re quite cold, they’re quite hard, and what, if anyone ever had those, that’s sort of like you actually built them into houses, and then they had little roofs as well, but quite complicated building sets. Joyce: What year they come in then? Andrea: Lotts bricks sort of like nineteen twenties really. Bit earlier actually maybe. I think they’re earlier than that. 42.20 – Joyce: I think they must be. That’s how they built all the aches in Brighton I expect. Andrea: Hopefully out of slightly larger bricks than these [laughter]. Imagine the amount of work. You know the viaduct? Imagine how many you’d need to build one of these? Andrea: You’ve got those ones. Joyce: I haven’t seen those before. Andrea: No, I’ll pass those round in a minute. Andrea: Yes. And then of course there’s wooden bricks. Does anyone remember having wooden bricks? Andrea: Yes, And I mean if anyone can remember being really really little, which I have to admit I can’t very well, then for really little children you used to have the ones with letters and numbers and things written on sometimes didn’t you, the wooden bricks or if you had children. 43.17 – Pat: Remember Betta Bilda now you’ve things made. Andrea: Oh yes. Betta Bilda. Pat: You build things. And you build it. My brother the big one. Andrea: Yes? How big was it? Was it bigger than him? Pat: I think so, I don’t know [laughing]. Andrea: And I don’t know anyone who had wooden bricks sometimes the challenge with wooden bricks was to just see how tall you could build the tower. Joyce: And then you got a big brother come along and do that with them. Andrea: Yes. Quite often. Or sometimes people used to do it on purpose so you’d sort of like, you’d build the tower and then you’d [‘until it falls’] yes, either until it falls, to see how tall you can get it before gravity takes over, or you’d build it and then deliberately roll things at them to make them fall over, you know like playing skittles or whatever. Andrea: Dominos? Yes, same sort of idea as dominos actually. 44.32 – Joyce: I wonder if anyone else has got an earliest memory of life? I can remember when I was two and a half. Joyce: I remember going to nursery school and we used to have to sit on a bench with a pillow on the table, and that’s where we’d have our sleep, and they we’d have a tray of sand to dabble in, and then I used to go home and then my mother would go across, we lived in Mitchum then, in Tooting, sorry. Cross the road was her friend. We used to have to cross the high street, my mother would cart me over there, lay me on the settee to sleep as the time she was there ’til it was time to go home [laughs] and then cart me across. That’s the earliest I remember of life, two and a half, yes. Andrea: Okay. What about anyone else? I always find this a really interesting question actually. Joyce: It is isn’t it? It’s very early isn’t it? Andrea: Yes, that’s really early. Andrea: What’s anyone else’s earliest memory? What’s yours Holly? Joyce: I know, it’s so early. Between that time I can’t remember much. My other brother’s two and a half years older than I and I know as I got older we used to go out together. We used to go to the flea pit cinema down the road and -. Eileen: I can remember my father pushing me on his bike up Edward Street to school quite, from the infant school, quite distinctly, yes, absolutely. Andrea: Okay. So you used to sit on the bike and he used to push it. Andrea: Nice way of getting to school. Eileen: Yes, it was. Not always. Joyce: I remember starting school, but can’t remember an awful lot about it. I was four or five I suppose then. That was in London. 46.56 – Andrea: The other thing I was going to say about these bricks, these wooden ones, is if you can see there, there’s a little arch, and we’ve got other ones here. Joyce: That’s right. You’ve got a reason for that haven’t you? Andrea: Yes. Little arches, this one here is like a little roof, so as I say I’ll pass these round in a minute, and so these are the sort that you can actually make little cities with or little towns. Out of shot: Noddy’s house is made from bricks. Andrea: It is isn’t it? Yes. I’d forgotten about Noddy. Pat: Noddy and Big Ears. Holly: Do they count as dolls or construction toys? Andrea: They count as dolls if they were cuddly, and they count as construction toys if you made something for them. Holly: Sorry, that’s a current debate that we’re having in the museum. Is it a doll, construction toy or bear? Andrea: Yes. We do have this big debate. Because we’re meant to have narrowed the project down and so it’s mainly dolls, bears and construction toys, but we have this big debate about what is a construction toy. Anything, well? Pat: Are you going now darling? Andrea: Are you alright there? Thank you for coming. Andrea: Shall we let him back in? Andrea: Yes, so if I asked you what a construction toy is, you’d say it was? Out of shot: Putting something together, or building it [‘building, yes bricks’], making it. Holly: We said it was something you build, but then have to take apart again to put away. Out of shot: That’s de-construction isn’t it? Holly: Yes. But there’s some construction toys or toys like Airfix models that we were debating whether they’d count as construction because you don’t play with them, you display them, so does that make it a toy still. 49.09 – Steve: Permission to speak. [Andrea: yes] My teddy bear that I had as a child, I actually used it as a canvas, which was a bit eccentric and not what you’re meant to do. I drew a school blazer on his chest, with the lapels and the pens and I hadn’t started going to school yet, but we lived in an area where Dorothy Stringer pupils went past with their blazers and their ties, and I thought oh right I’ll put that on my teddy bear, because after a while just got fed up with the teddy bear I thought I’m too grown up for a teddy bear now, but my Mum kept it in the loft for decades [laughter] and produced it recently. Holly: we’ve had a few stories of children drawing on or punking up, we’ve got a couple of dolls with drawing pins in them and nails to make them look punk or goths. We’ve got a couple of stories coming out about that. What about anyone else. Do you remember adapting your toys or making them better. Pat: I used to play with Lego with the things round and windows Joyce: I can’t remember much about toys at all. Holly: So if everyone’s finished their tea we can start looking at the construction toys. Joyce: Is there a place for the cups? Oh thank you dear. Thank you very much. Holly: Do you want to pick the bricks? Out of shot: Bricky ones, yes. Holly: They’re the wooden ones, but we’ll bring bricks round in a minute. 57.23 – Steve: Did someone mention Betta Bilda? [Andrea: Someone did mention Betta Bilda’ Pat: I did’] I think, is there some Betta Bilda pieces there or is that all Meccano? [This is Bayko’] Betta Bilda was spelt B, E, double T, A. B, I, L, D, A, and that’s how it was meant to be, and I knew that was an incorrect spelling, but when I mentioned it in an essay at school that I then played with my Betta Bilda, the teacher just crossed it all out, in red pen and put Better, Builder, correct spelling. That was as bad as SP, for spelling. Andrea: Was Betta Bilda a bit like Lego? Steve: Not quite as good. Holly: Nothing is as good as Lego though. Steve: You’re absolutely right. Well its iconic as they say now isn’t it? Holly: Yes. Do you guys remember playing with Lego then? We haven’t brought any with us. Pat: Yes. I liked building houses and that. Jethro: I used to play with toys like crackers and used to have spinning tops toys. Holly: We’ve got a very impressive tower going on over here. Andrea: I’m liking this tower. Steve: Oh Meg. You didn’t tell me about your hidden talents? And hidden talents rhymes with balance. Jethro: How’s that? How’s that. Twenty points for that. 59.22 – Pat: I wish it was Betta Bilda and then I could play with it. Andrea: So that’s the idea with Bayko anyway. Holly: So what was Betta Bilda? I haven’t heard of it. Out of shot: And sticklebricks. [Pat: ‘Sticklebricks yes’] Didn’t bring the Sticklebricks up either. Pat: [overlapping] Oh Sticklebricks, yes. Andrea: Well we’ve got three big boxes full of stuff and we couldn’t fit it all in the taxi. Holly: We’ve got three boxes this size that’s down here. One’s full of the dolls, one’s full of construction toys and one’s got the bears in, so we thought we’d bring you a mixture of all three. Pat: Its good idea you bring them. Holly: I think that’s definitely sparked some of your memories. Andrea: Yes but I always remember Sticklebricks as being really annoying. They would never make things properly, they were always off centre. So are there any other things that people can remember about dolls, bears or construction toys that you want to fling out there. Andrea: I don’t know who you are April, but hello. 01.03.05 – Steve: I used to find if you had Matchbox and Dinky cars which are all like rival companies, they made them all different sizes a bit like those that remember VHS and Beta Max and all that, and it’s still going on now with IPads and what have you. And I never used to get frustrated by that at all, I just used to think right [sound of tower crashing down] we’ll have a superhighway in my room with the big daddy lorries and the not so big lorries, and just make my own entertainment that way. Steve: I knew you’d agree Pat. Andrea: Well you used to get that, you know you used to get Lego and then you got sort of imitation Lego that wasn’t compatible and didn’t quite fit together with proper Lego bricks [picking up bricks in background] and I know I was talking to someone at the museum a while ago about Meccano and they said that the instructions for Meccano were never quite right, that you used to follow the instructions and somewhere along the line there would be a mistake, and you would have to put it right. Andrea: Either that or there’d be instructions in the book about here is this model you can make but you haven’t actually got all the bits in the box of Meccano. Holly: Sounds a bit like Ikea and flat pack furniture doesn’t it? Andrea: That’s what you were just saying over there? 1.04.44 – Joyce: I remember my brother had a Meccano set and he built a steam engine which actually worked from it but of course he was two and a half years older than I was. I always remember that. He built a Meccano set with a steam thing on it which actually worked. Joyce: That was years ago. Jethro: They used to call toys like what she does, misfits because there was something missing or something not right with it. Andrea: But sometimes I think it’s when people are building construction toys that don’t quite work, and they need to work it out for themselves, then that’s when some people get really good at that. [Joyce: Yes’] and they’re quite often the people who then grew up to be engineers or whatever. Holly: It definitely makes it more of a challenge, and it challenges the person or the child making it more doesn’t it? Probably puts that element of educational benefit in as well. Holly: Yes, you won’t go to sleep ‘til past bed time, but definitely benefit you in the long run. [overlapping] Pat: Sometimes people dream about it. Andrea: Yes, Because that’s the other interesting thing I think about construction toys is whether people followed the instructions of what they were told they were meant to be making with it, you know whether it was Meccano or Lego or Bako, or whether they just went well here’s a box of bricks, and a box of bits let see what I can make. You know and I think it’s different approaches isn’t it? Jethro: Some kids make good stuff with bricks don’t they? Holly: You remembered lots of stuff that will help our project. Members of group: Grenville, Joyce, Gladys, Eileen, Pat, Phillip, Jeffrey (‘Jethro’), Meg. Also present were Steve (community worker) and an unnamed woman. Andrea: We’ve come up from the Toy Museum that’s underneath the station, and what we’re doing is we’re running a project collecting people’s memories of dolls, bears and construction toys. So what we’d like to do today is just collect some of the memories from you, we’ve also brought some along that you can have a look at. But before we start thinking about it, and Holly’s going to be asking some of the questions, I’d like us if it’s okay with you to go round, so that we know who you all are. And if you could all just say your name, and just your first name is fine, where you were born, and when you were born, so just the year, we don’t need your birthday. Does that make sense? Is that okay? Pat: Yeah, sort of. Yeah but, no but. Andrea: So if we start over here, what’s your name? 03.11 – Holly: So who remembers their teddy bear? Who wants to go first? 04.56 – Andrea: Okay. So maybe we’ll think about dolls then, if no one can remember teddy bears. What about dolls? Can anyone remember having dolls? 07.52 – Holly: So how about construction toys. Does anyone remember having or playing with construction toys? 11.03 – Andrea: Did any of the rest of you have toys that were handmade by grown ups? Steve: I think I grew out of them within the next six months. Andrea: So you didn’t repaint them then? 13:50 – Gladys: I do remember having a dolls house, but the thing that I have had, nothing to do with toys really, a pencil and paper. And I’d draw for ever, draw all sorts of things. And that lasted me right through my life up ‘til recently, can’t do it now. Jethro: Yes well I did, but I’ve got ten kids stopped me you know like, pulling me back and all. It was this certain one boy at the time you know took me round the house, cooled me down its a nice boy and I still know him now, you know. 17.36 – Andrea: Thinking about toys. Shall we have a look at what we’ve got here Holly? Andrea: And I think you know you were saying about swings from lampposts. I think it depends on where you grew up. So if you grew up in a town, then you’d probably be making swings from lampposts, if you grew up in the country, you’d probably be making swings from trees or you know? 18:58 – Meg: My mother was an orphan, and she didn’t have anything in the orphanage, and I don’t think she knew much about toys and things, and she got a job when she left, and she was supposed to look after a baby, push the pram and take it for walks in the pram and she couldn’t push it straight because she’d never had a dolls pram herself, she didn’t know how to treat her own babies because she’d never had anything herself. A rather strange situation. 20.38 – Holly: We could send round a few of each. Steve: Hello Peter. Hello Peter. 24:32 – Andrea: That one you’ve got there, that’s Archie. Pat: Yes. I’ve been there, but not very near here. Pat: Oh look, she’s got three now. 28.24 – Holly: You can carry on talking if you like. So we’ve got a few of the dolls as well. Do you want to pick one? Do you want to pick one? No? Jethro: Not that one. Gawd. Haven’t you go a better one than that? Holly: Which one would you like? 30:54 – Meg (re Tiny Tears): She doesn’t look like a doll at all. Holly: Do you want this one? Jethro: Bit scary that one isn’t it? Out of shot: No she hasn’t. Andrea: It would. Yes. The lady who gave us that for the museum, told us that when she first got it, she did drop it, and her father had to fix her arm with, I think she said Elastoplast. So one of her arms is at a slightly different angle to the others. Because it’s actually all taped together at the top. But apparently I think she said she dropped it. I can’t remember if it was the day she got it or just afterwards, but yes, if you look carefully at her you can see where her paint’s chipped off, she’s all sort of grey underneath. They were really delicate a lot of those old dolls, so you know they were made out of that or they were made out of china, so I think if you had those sort of dolls you had to be really careful how you played with them, or as you say they’d just break wouldn’t they? 35:45 – Jethro: I’ve got a little doll I put on the Christmas tree at Christmas. Little fairy doll on the top. 36.23 – Jethro: I know but it’s not my cup of tea really, but my mum, my dad used to get one for my mum and she always put it on top of the Christmas tree, you know and that’s how it’s there – and I’ve still got it now. Holly: Yes, I think she’s a bit scary. Andrea: Its up to you. I was going to say what we can do is we can sort of like look at the construction toys and then have tea and chat and carry on or break for tea now. Up to everyone else. 40.03 – Andrea: So we talked a bit about dolls, and you’ve had a look at some of the dolls. 40.11 – Andrea: Yes, we talked about the bears. So the other one I’d just like us to sort of like have a think about is these construction toys. [‘eh?’ ‘construction’] construction toys. I’m not going to pass them round right now because you’re still all juggling tea. Andrea: So when we pass them round in a minute you can Holly: They’re quite cold like stones aren’t they? Joyce: I think they must be. That’s how they built all the aches in Brighton I expect. Pat: Remember Betta Bilda now you’ve things made. 43.33 – Joyce: I wonder if anyone else has got an earliest memory of life? I can remember when I was two and a half. 46.00 – Andrea: The other thing I was going to say about these bricks, these wooden ones, is if you can see there, there’s a little arch, and we’ve got other ones here. Out of shot: Putting something together, or building it[ ‘building, yes bricks’], making it. 48,09 – Steve: Permission to speak. [Andrea: yes] My teddy bear that I had as a child, I actually used it as a canvas, which was a bit eccentric and not what you’re meant to do. I drew a school blazer on his chest, with the lapels and the pens and I hadn’t started going to school yet, but we lived in an area where Dorothy Stringer pupils went past with their blazers and their ties, and I thought oh right I’ll put that on my teddy bear, because after a while just got fed up with the teddy bear I thought I’m too grown up for a teddy bear now, but my Mum kept it in the loft for decades [laughter] and produced it recently. 56.00 – Steve: Did someone mention Betta Bilda? [Andrea: Someone did mention Betta Bilda’ Pat: I did’] I think, is there some Betta Bilda pieces there or is that all Meccano? [This is Bayko’] Betta Bilda was spelt B, E, double T, A. B, I, L, D, A, and that’s how it was meant to be, and I knew that was an incorrect spelling, but when I mentioned it in an essay at school that I then played with my Betta Bilda, the teacher just crossed it all out, in red pen and put Better, Builder, correct spelling. That was as bad as SP, for spelling. Pat: I wish it was Betta Bilda and then I could play with it. Andrea: Oh yes. [Pat: ‘Sticklebricks yes’] Didn’t bring the Sticklebricks up either. Steve: I used to find if you had Matchbox and Dinky cars which are all like rival companies, they made them all different sizes a bit like those that remember VHS and Beta Max and all that, and it’s still going on now with IPads and what have you. And I never used to get frustrated by that at all, I just used to think right [sound of tower crashing down] we’ll have a superhighway in my room with the big daddy lorries and the not so big lorries, and just make my own entertainment that way. Joyce: I remember my brother had a Meccano set and he built a steam engine which actually worked from it but of course he was two and a half years older than I was. I always remember that. he built a Meccano set with a steam thing on it which actually worked. Andrea: Yes, Because that’s the other interesting thing I think about construction toys is whether people followed the instructions of what they were told they were meant to be making with it, you know whether it was Meccano or Lego or Bako, or whether they just went well here’s a box of bricks, and a box of bits let see what I can make. You know and I think its different approaches isn’t it? 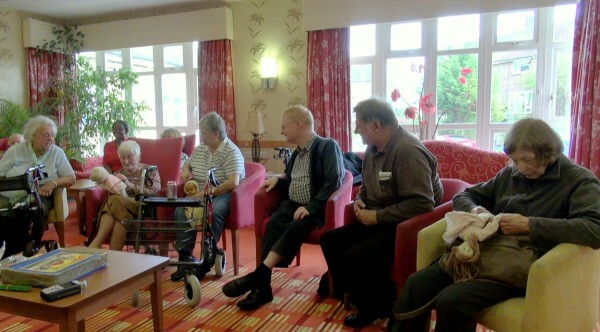 Members of the New Larchwood Reminiscence group discussing their memories of teddy bears, dolls and construction toys. The short version of the video (3m 45s) is focused on dolls and teddy bears, while the full version (1hr 06m 55s) covers a range of toys, as well as other memories of childhood.